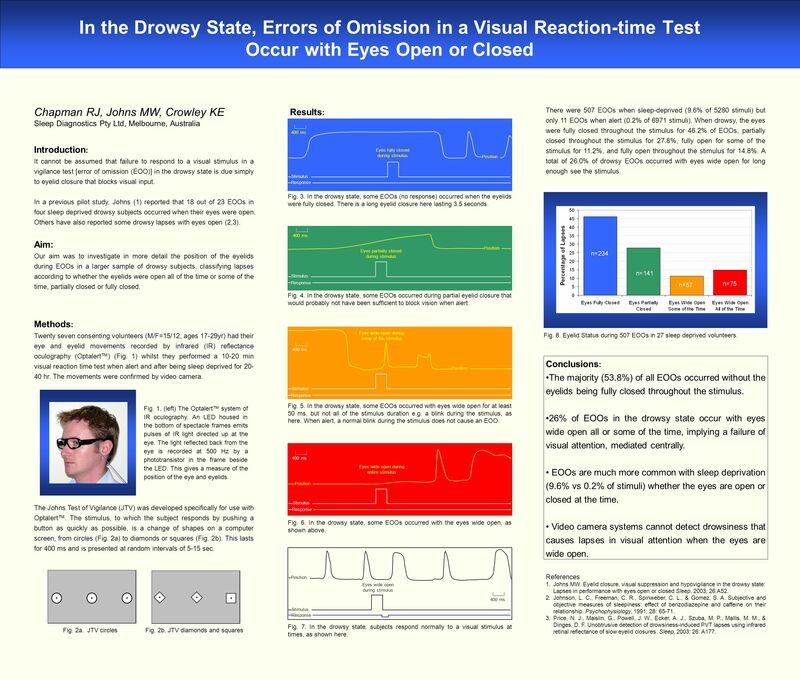 In the Drowsy State, Errors of Omission in a Visual Reaction-time Test Occur with Eyes Open or Closed Chapman RJ, Johns MW, Crowley KE Sleep Diagnostics. Download ppt "In the Drowsy State, Errors of Omission in a Visual Reaction-time Test Occur with Eyes Open or Closed Chapman RJ, Johns MW, Crowley KE Sleep Diagnostics." The Amplitude-Velocity Ratios for Eyelid Movements During Blinks: Changes with Drowsiness Johns, MW, Tucker, AJ Sleep Diagnostics Pty Ltd Melbourne, Australia. An Ocular Measure of Drowsiness and the EEG: Changes with Sleep Deprivation Crowley, KE 1, Johns MW 1,2, Chapman RJ 1,2, Tucker AJ 1, Patterson J 2 1.